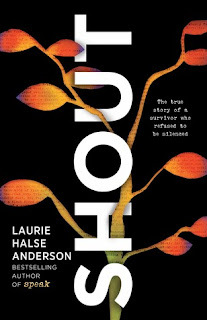 I often wondered how Laurie could write such raw, emotional and spot on books. After reading Shout I understood how her writing has evolved. The authentic voice in each book came out of her own pain and experiences. Shout is one of those books that reaches inside of you and grabs your guts and twists them. It is painful yet for some of us it is also a release. You know that someone has grabbed hold of your guts to help untangle them. That is what this book does. I met Laurie years ago at an English conference. I stood in line with her book "Speak" to get it signed. I handed it to her but would not look at her. She held on to the book as she handed it back forcing me to look up at her. Then she said, "You're Melinda." My lip quivered as tears slid down my face. She hugged me and and for the first time I felt the strength to do something. Laurie never knew how she helped me. My abuser was a family member. My meeting with her gave me the courage to put myself into counseling. The next time I saw that family member I pulled them aside. They had long ago sought counseling for the incident. At the time I felt so dirty and ashamed that I didn't want anyone to know. and I didn't want anyone to talk to me about it. My mantra was, "God forgave them so it's done and over with." For me it wasn't. On that day I walked up to them and told them. "God forgave you and so have I, but I haven't dealt with it. I'm doing that right now. Understand there will days that I hate you as I go through this process. There are days you can't talk to me or hug me or anything else. I hope you will respect that." They sidestepped and said they would do whatever to help me heal." That was not what I expected. Healing is a long process. If you read Laurie's book you will understand it. We all have to find our path and our voice. Laurie's book is raw. It takes you through her painful life. It takes you through the events that led up to her getting her voice back. I read and thought about the different people and events in my own life that paralleled hers. My family life unlike hers was not as volatile. My parents were very strict Christians. This is one reason I suffered so long. As Christians we were told you don't talk about certain things. You let things go and let God handle it. I walked through each painful moment with her. When she is accepted as an exchange student she became a new person. She was away from her old life and was given the opportunity to see what a healthy life is like. She was given the strength to grow and become the person she is today. This event put her on the path to healing. It is never done and over but you gain the strength to move on. I know of no other author who's books have helped both students and adults as much as Laurie's books. I highly recommend her book "Shout". It explains so much about the other books.